Probably a reference to the Ways and Waygates of the Wheel of Time series, which are in that universe closely related to the Ogier race, though not built by it. The Gordunni Ogres at Gordal Fortress in Talador drop them at a decent rate. I farmed them in groups of 4 or five starting at the base of the fortress than moving up. They sit in groups of 2-3 so its not to hard to pull groups of 5 or 6 at a time. if you are on that quest or have completed it, you can enter the fortress using the rope/portal that is just to the left of the force field blocking the entrance. Just found this new location which is MUCH better then the previous. Drop rate is very high. Grimfrost Hill located at around 66 47. Took me about 15-20 5-10 mins to gather the 25+ stones using this area. Spires of Arak at 54.6, 51.6 by Veil Zekk. Talador at 55.1, 48.1. Thanks "decompiler" for the edit. Frostfire Ridge at 61.5, 45.6 by The Crackling Plains. It takes a total of 25 stones to unlock a portal. You can have a total of 3 portals in a level 3 mage tower. It is still Available. But i don't know if it still can be done. Can Confirm that You need to gather 25 of them .. the Pedra de Pórtico Ôgrico and you need afterwards use one of the portals outside in the Dreanor! so don`t just teleport to your Garrison stright away (like I did :D). Found them in near of Gronn Canyon in Gorgrond.. a bit of farming was involved.. If you try to do so, you'll get a message saying that it requires a Mage Tower. The rope is coiled up on the ground. It sort of looks like a little gray rock. That might save some time in case you are looking for a rope hanging from the wall. These waygates are useless! The Nagrand gate is on an island in Horde territory populated with 100 elite beasts.. For Alliance, this is totally useless. What's the point of this? The Talador gate is equally useless, in the middle of no where with a good hike to the nearest flight path. Be warned, handing this quest in with excess waystones will remove them from your inventory. I have a level 2 mage tower now but I can't activate my second waygate. I have the one in Gorgrond now but that's it. I have 25 waystones in my inventory so that can't be the problem. Does anybody know what I'm missing here? To deactivate a gate, you can just talk to the ogre at the gate and ask him to do so. It will cost you 10 stones. When being ported to FFR from the Magetower in your garrison, you arrive at 59.7, 47.1 (just in front of the stone). There really isn't any safe paths between the Nagrand waygate and almost anywhere you'd want to go. If you've got a raid with you it shouldn't be a problem otherwise you'll have to juke around a some uber elite mobs. Of course, as the expansion progresses and we've all got iLevel 1000 it probably wont be a problem then either. Watch your inventory, if you get the max 60, they will no longer drop. It's probably worth noting that you have to be at where the portal would take you to to activate the waygate (You can't open it from your Spirit Lodge, only go through it once open). It took me a while to locate this information and spent ages running around my Spirit Lodge looking for the thing I had to click. As of April 3, 2015 there is no longer a 60 cap on the ogre stones. I farmed 130 today and they stacked nicely so apparently this has been fixed! YAY! As of April 3, 2015 there is no longer a cap of 60 ogre stones. I farmed 130 today and they stacked nicely so evidently this has been fixed. YAY! 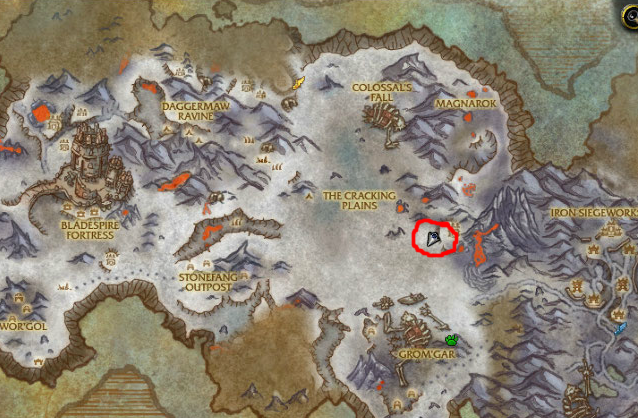 Another good farming location: Nagrand's Vault of the Titan (entrance at 66, 49) has several Highmaul Laborers inside who drop a lot of Ogre Waystones. I was getting 2-3 from every one of them. Super unfair. You can't open a waygate to Tanaan Jungle unless you have a level 3 Mage tower/Spirit lodge. UGH. I wish someone had told me that before 6.2 dropped. /way 53.45, 58.13 At least in the alliance side. Be advised: To access the Waygate in Tanaan, your Mage Tower/Spirit Lodge is required to be at level 3 in order for you to be able to open the Waygate. The Tanaan Jungle Waygate is located at 53,58. A lvl3 tower is required for this gate. Man... if Blizzard would add a system like this for accessing old world zones it would easily be one of the best updates ever. Note that, unlike some other quests, you must have the waystones in your inventory (not your bank!) to activate a waygate. I can confirm this is still true. I lost my excess waystones upon completing quest. Found some contradictory information here about the issue when handing in this quest, so here's what I found when completing it a few minutes ago. There still seems to be an issue with this quest in 7.0.3. If you have any spare waystones in your bags, completing it will remove up to 25 additional stones. To test this I collected 100 stones. 25 were removed when opening the waygate, and an additional 25 were removed when handing in. I'm guessing this is a bug, since handing in with no waystones in your bags works fine. Any spare waystones stored in your bank is safe. Well, this pretty much cements the feeling I had that Wheel of Time has been super influential on WoW's devs. Colete 25 Pedras de Pórtico Ôgrico e use-as para ativar um Pórtico Ôgrico em Draenor. Seis pórticos únicos existem em Draenor, construídos por magos ogres em eras passadas. Descobrimos que a potência deles não se enfraqueceu com os milênios. Se você coletar pedras de pórtico ôgrico suficientes para ativar um desses pórticos ancestrais, poderemos construir um portal de mão-única da sua guarnição àquele lugar. Seu empenho será recompensado, <name>. Os antigos portais estão ao seu dispor.